Bennett Brinson Gamel: Fighting Cystic Fibrosis: Why so quiet? The blog has gotten quiet. I mean qui-et. ...that's because things in our life with regard to Cystic Fibrosis have been going so goooood! But otherwise, Cystic Fibrosis is not even something we are having to think about much these days. Bennett's weight is looking great. We haven't been to the doctor in a few months. And we are luckier than many of our healthy friends! We haven't had but one summer cold all summer long! And it's awesome to feel great!! ...the kind of I-just-got-done-with-the-flu-but-now-I-feel-so-much-better wonderful!! 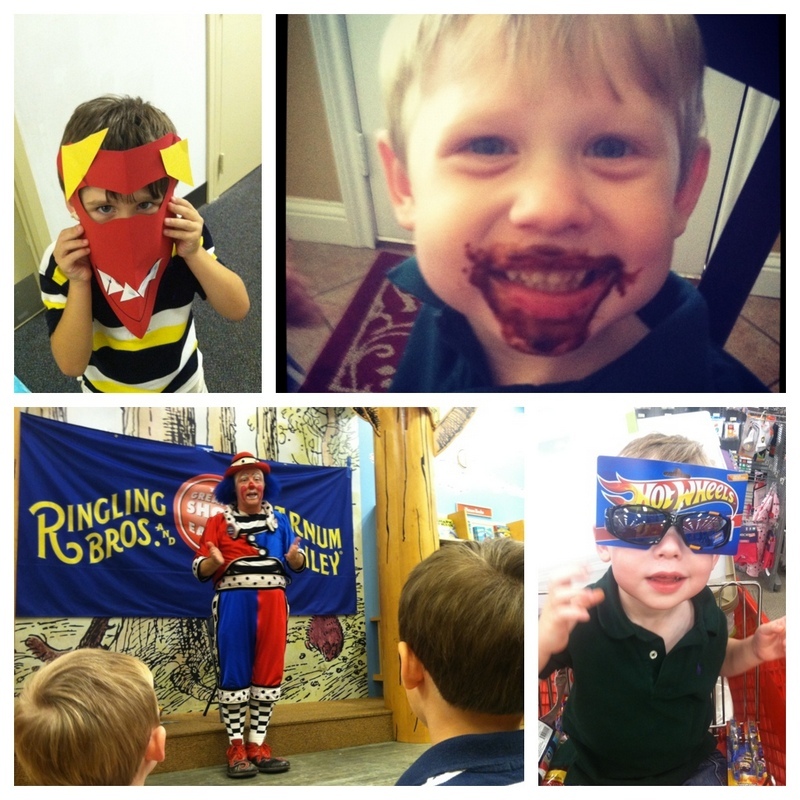 Clockwise: Oliver makes a mask at school, says it's an "Angry Bird"; Bennett sports a chocolate donut beard; We happened upon a free show at Barnes and Noble, clowns are very very funny at 2 and 4 years old; Bennett enjoys his new glasses at Target, even though he can't see a thing.